Take a RIB ride around the South Wales coast and take in the hidden gem, Flat Holm Island, which should be top of your list of things to see in Cardiff! . Looking for Kids birthday Party ideas? 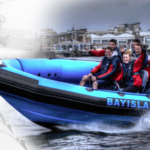 Why not book one of our Cardiff Bay boat trips? They are top of most people’s lists of things to do in Cardiff.